No matter what grocery store I go to, ground beef is always sold in packs of either 1.25 pounds or 2 pounds and higher. Most recipes call for one pound of meat exactly. So, what are you going to do with the extra quarter pound of meat? If you're like me, you'll put it in the freezer knowing that it will probably be used sooner or later. I looked in the freezer the other day and I had six quarter-pound bags of ground beef. SIX!! Who does that? Guess what was for dinner that night? Something with ground beef. I usually make meatballs, chili, meatloaf, etc. with my ground beef, but I had an urge to try something new. 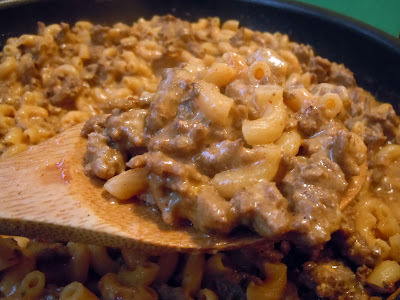 I did a quick search in Google and this recipe for Homemade Hamburger Helper popped up. I'll admit I've only tried the actual Hamburger Helper one or two times, but it wasn't half bad. I decided to give this a go thinking that getting rid of the preservatives and fat content of the store-bought version would make it better. And it sure did! There was a light chili flavor, and the cheese and milk made it thick and creamy. I also used all reduced-fat ingredients, so it wasn't even all that bad for me. It probably took about the same amount of time the store-bought version takes, too. About a quick 30 minutes. You can even prepare the dry seasoning mix and store in a ziplock bag so that it's ready to go next time you decide to make this meal! 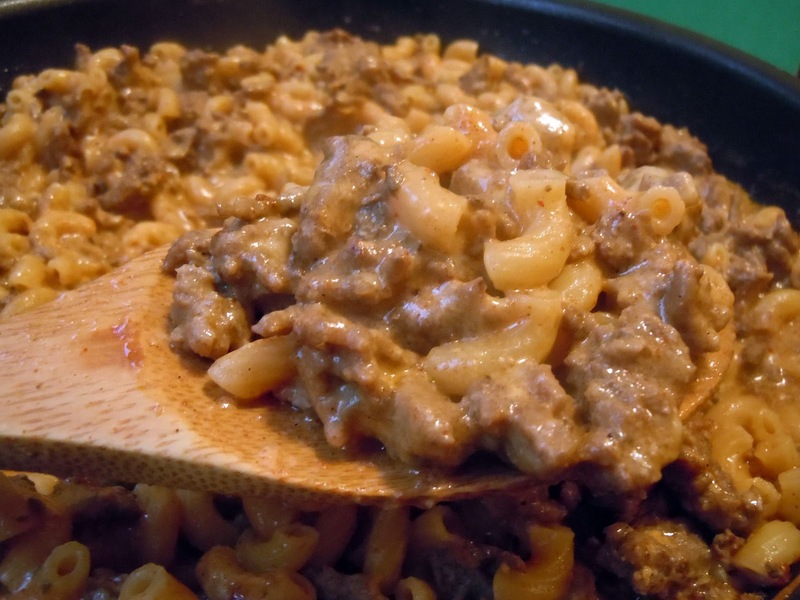 Next time your kids ask for Hamburger Helper, give this recipe a try instead. You'll thank me! Brown beef in a large skillet. Drain and add back to skillet. Combine corn starch, chili powder, garlic powder, salt, sugar and paprika in a small bowl. 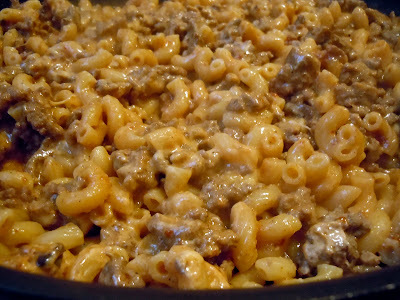 Add hot water, milk and macaroni to the beef in the skillet. Stir well and then add the dry ingredients. Let the mixture come to a boil. Cover and reduce heat to low. 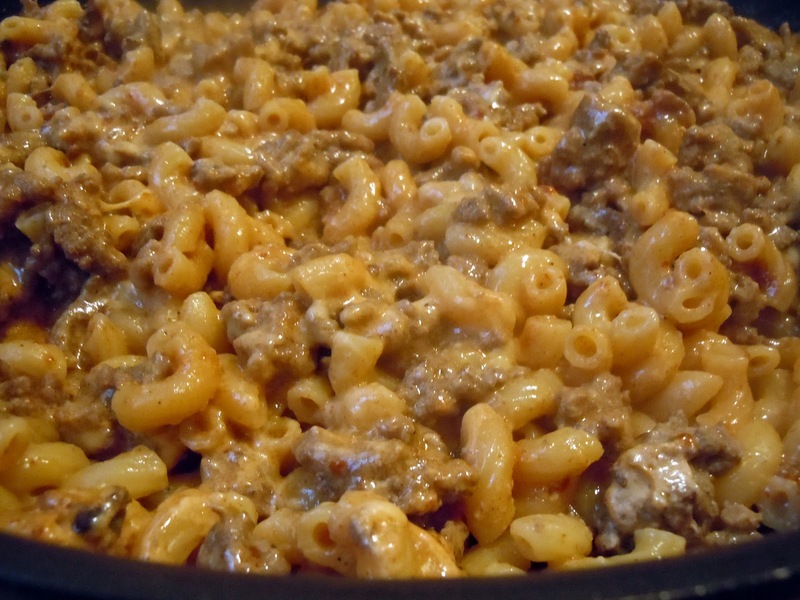 Let simmer for about 12 minutes or until the macaroni is tender, stirring occasionally. Add cheese during the last few minutes of cooking. Let stand for about five minutes so it can thicken. Serve immediately. Great recipe info! I recently came across your blog and have been reading along. I thought I would leave my first comment. I don’t know what to say except that I have enjoyed reading. Nice blog. I will keep visiting this blog very often. What an amazing and quick to make a hamburger recipe. I just came crossed your blog when I was searching for a hamburger recipe and I just loved it.